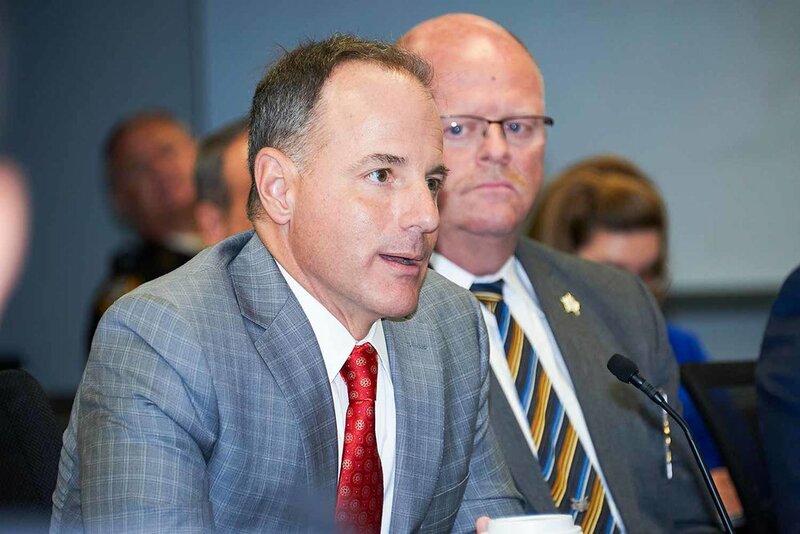 Body-worn cameras and pending legislation regarding disclosure of the recordings comprised the majority of discussion Wednesday, Aug. 23, when legislators convened at the Department of Criminal Justice Training. State legislators from both the Interim Joint Committee on Local Government and the Interim Joint Committee on State Government listened to Kentucky House Rep. Robert Benvenuti (R-Lexington) regarding House Bill 416, which was first introduced to lawmakers during this past spring’s legislative session. The bill would add new language to Kentucky’s Open-Records Act regarding the retention of body-worn camera recordings, as well as exceptions for when a public agency may choose not to disclose the footage. Procedures for requesting body-worn camera video would be established and guidelines would identify when a person depicted in the recordings must be given notice of any public display. The purpose of the legislation, Benvenuti told his fellow legislators, is to create a construct that balances individual privacy rights with the public’s right to know. The law also would support law enforcement agencies battling a variety of issues regarding the storage and release of body-worn camera footage. While body-camera footage can be a useful tool in training and often leads to protecting officers from false complaints, Benvenuti said the public should not have full access to video that, for example, depicts children in a critical situation nor the death or injury of an officer in the line of duty. Bellevue Police Chief Wayne Turner, who served as a representative both of his agency and the Kentucky Association of Chiefs of Police, said he personally had experience with a news organization recently that requested five years of body-worn camera footage from 30 northern Kentucky law enforcement agencies. J.D. Chaney, deputy executive director for the Kentucky League of Cities, Lexington Police Officer Jason Rothermund (president of Fraternal Order of Police Bluegrass Lodge 4), Louisville Metro Police Officer Nick Jilek (legislative agent of Kentucky FOP) and Campbell County Sheriff Mike Jansen (representing the Kentucky Sheriff’s Association) all spoke in support of the legislation. Chaney and Jansen both reiterated Benvenuti’s statement that through the course of finalizing this legislation, at no time do they support mandating Kentucky law enforcement agencies’ use of body-worn cameras. The costs well beyond the initial purchase of the equipment, to include storage systems, software and personnel, would lead to an “unfunded mandate” for many agencies, Jansen said. Jilek noted that the sensitive nature of law enforcement tactics, as well as confidentiality with witnesses and crime victims, is a concern for the Kentucky FOP as it relates to release of body-worn camera footage. Particularly of note, he said, is the release of video to social media that is gratuitous and might re-victimize victims and re-traumatize first responders.